After a nearly yearlong absence, the LBC’s celebrated Sculpture Garden reopens with a new exhibition on September 13th. Work by three Bay Area artists — Kati Casida, Catherine Daley, and Jann Nunn — is featured in Harmonies, the new outdoor exhibition opening Thursday, Sept. 13, 2018 at the Luther Burbank Center for the Arts in Santa Rosa, in central Sonoma County. 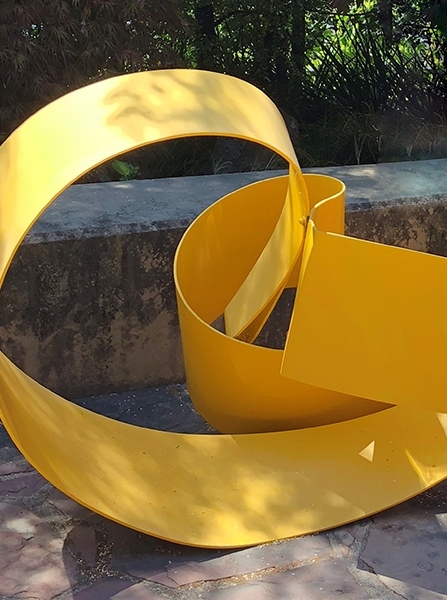 Exhibit curators Kate Eilertsen and Anita Wiglesworth selected these three sculptors to bring a lively and lyrical experience to the Luther Burbank Center for the Arts sculpture garden, evoking a sense of nature, movement, and light. The works on display represent an eclectic fusion of ideas, materials and images. 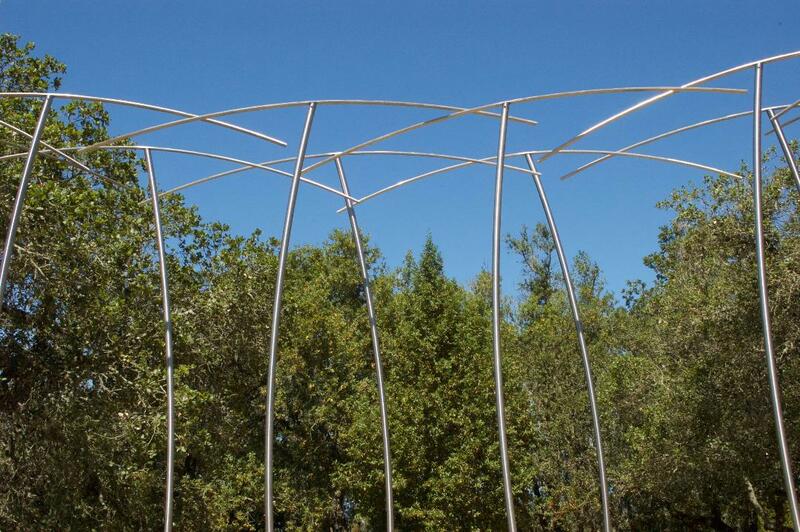 The sculpture garden has been thoughtfully restored following the 2017 firestorms, and designed to reflect the local Sonoma County landscape. Casida, Daley, and Nunn bring an inspired harmony to the space. The exhibition showcases four sculptures from each of the three artists. While each expresses her own distinctive style and concept, the exhibition as a whole conveys a collaboration of their individual connection with nature. 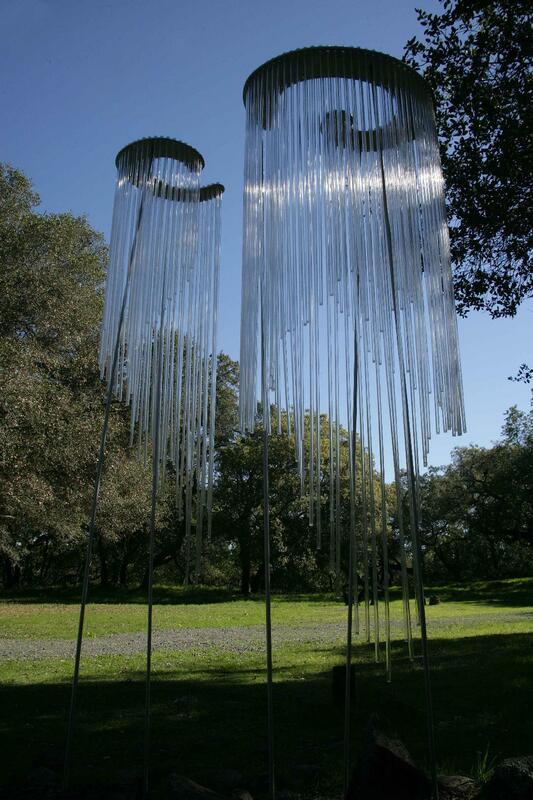 Casida’s work implies motion and a continuous passage through space, inviting visitors to view natural elements inside, outside, and through her work. “My study of modern dance patterns helps me to realize how I want to cut through space with my materials and color,” Casida says. As a unified manifestation, the sculptures in the exhibition create curtains of light and colorful dancing shapes as well as quiet spaces for reflection and immersion. There is a sense of the three artists interacting and “playing together” through their individual pieces, which feel like ribbons of light and color punctuating the garden area. As both a tribute to the losses incurred by the fires, and a symbol of resilience after tragedy, the new exhibition is a dramatic and stirring experience and encourages visitors to reshape their own personal landscapes and think differently about the surrounding world. The reopening this fall of LBC’s Sculpture Garden is an important step forward for the center and the community. The new Harmonies sculpture exhibition will be open to the public on Thursday, Sept. 13, 2018 and will remain on display through Sept. 20, 2020.